In my reporting I have spotted a total of four DX (distant) stations doing digital meteor scatter. All of them are using the old FSK441 mode instead of the newer MSK144. This is somehow a pity. MSK144 performs much better than FSK441, so it should completely replace it. In fact, the authors of WSJT-X have not implemented FSK441 in WSJT-X, as it is rather pointless. The old WSJT (now completely superseeded by WSJT-X) has to be used for FSK441. I hear that in the USA MSK144 has become really popular, wiping out all FSK441 use. However, it seems that in Europe FSK441 is still the most popular mode for 2m meteor scatter by far. I wonder what can be done to increase MSK144 activity. The timestamps I will give for the signals shown here are realtive, referring to the beginning of the recording (which was 08:56 UTC). The resolution of the waterfalls is 22Hz or 45ms per pixel. At 00:01:05 we have a short 100ms ping from C37MS, a Belgian team that does meteor scatter from Andorra. At 00:28:25 we have F6KBF, a radio club near Paris, France. At 01:08:00 we have a weak ping. I was only able to decode the locator JN05, which is in the Limousin region, France. At 01:24:50 we have DF2ZC, a station in South West Germany. Besides these DX stations, in the recording there are a lot of FSK441 transmissions by EA4SG, who lives in Colmenar Viejo, a few kilometres away from my location. Therefore, his signal is pretty strong. An interesting find was the following CW transmission at 01:26:15. It reads “S50C S50C NNT KKK”. I don’t know whether S50C, a radioclub station in Slovenia, was the transmitter or the receiver of that message. The resolution for the image below is 47Hz or 21ms per pixel. 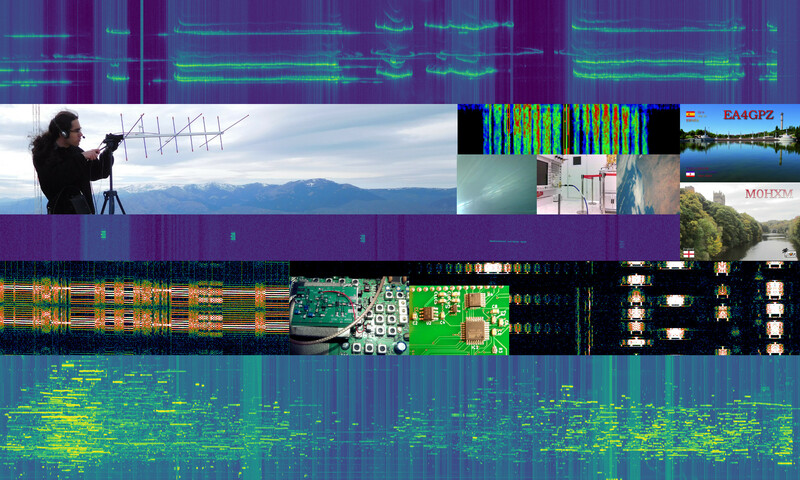 The recordings for the signals shown in this post, as well as the scripts to produce the waterfall images can be downloaded here.